A second generation version of the Snapchat Spectacles has seemingly passed through FCC for certification. 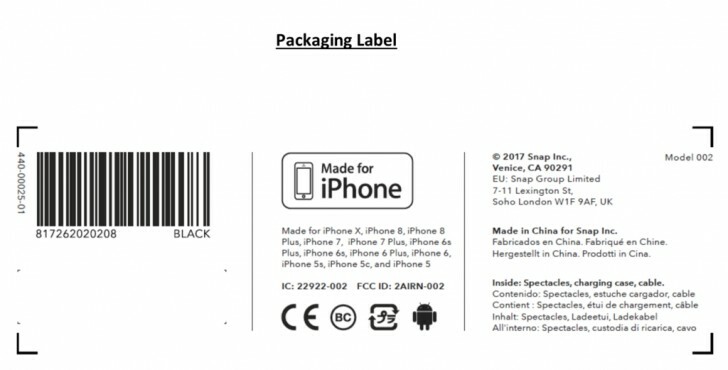 While the FCC documents don't name them as such, the leaked packing label and the fact that it's called 'Wearable video camera 002' in the FCC filing doesn't make it awfully hard to guess what it could be. The upcoming arrival of a second generation model has been rumored for a while, with the new model promising improved performance but not much else. A second wearable camera accessory is also rumored for 2019 with two cameras, GPS and a $300 price tag but nothing concrete has surfaced about that yet. The first generation Spectacles were an instant success with users of the service, with long lines out of popup booths that would run out of stock quickly. For whatever reason, Snapchat chose not to sell these the normal way, instead relying on the short supply to create hype and exclusivity for the product. This ended up backfiring spectacularly on the company when the hype died down, and it ended up with $40 million worth of unsold inventory that no one wanted anymore. Taking that into consideration, and the fact that Snapchat is now on the downswing anyway with more and more users switching over to Instagram, one has to wonder how much sense launching this product would make. If at all they do it.